So what do you do with a bunch of roasted red bell peppers? Make pesto of course! There is about a zillion ways you can make pesto, and truth be told I don't follow the same exact recipe every time. It depends on what I have on hand when I make it. 1. Toast your nuts on a dry sauté pan over medium heat for a few minutes, stirring occasionally. Nuts will turn golden in color. 2. If using jarred peppers, drain them. You can also make your own. 3. Add all ingredients into a blender or food processor and pulse until smooth. Add salt and pepper to taste. I find it’s best to let the pesto rest for a bit to allow the flavors to develop and deepen. An hour or so is fine. If you want a brighter red color, you can omit the parmesan cheese. Thoughts: I adore pesto and I love roasted red peppers, so obviously I love this. Pesto is great in a variety of ways, by itself with some good crusty bread, used in pasta dishes, on sandwiches, the possibilities are endless. I plan on using this pesto to make a couple of dishes in the coming week so I’ll be sure to share any that turn out to be successful. I have to say though, while this pesto is very good…. The Arugula Walnut Pesto is still my favorite. I didn't realize this was so easy to make. Delightfully simple. 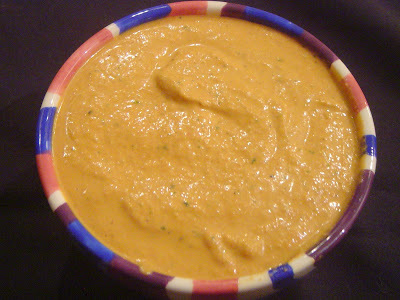 When I have lots of roasted red peppers, I like to make hummus. But now I have something new to try. Thanks!